Federal's special wad and powder amp up killing power. Federal has landed on one of the hottest waterfowl load combinations possible based on new elements that make up a high-performance shotshell. Just after first light, a trio of giant Canada geese came rolling out of the dense, ice-coated winter air. At first, they seemed like ghosts -- their large bodies appeared as faint gray shadows, and then emerged from the cold ground fog like so many prehistoric pterodactyls on a strafing attack. The scene had played out hundreds of times before during my 50-plus years of gunning Canada geese, but like always, I was in awe and wonder at the sight. 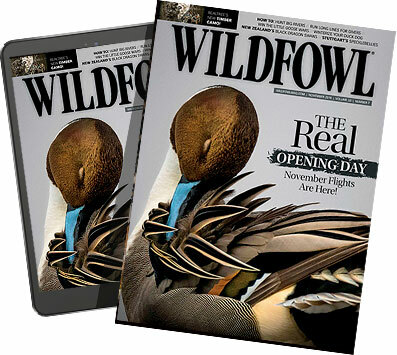 My partners and I hunkered in layout blinds clutching 12-gauge waterfowl guns chambered with a brand-new round that had been sent for evaluation by Federal Premium Ammunition, two weeks ahead of the national SHOT Show in Las Vegas. The new specialized ammo soon to be recognized as Black Cloud Snow Goose was not going to be released until that time, but Federal felt I could keep a lid on the subject until it was officially introduced. As the big birds closed, my partner, Tyson Keller, gave the order. Three short, high-velocity cracks echoed into the fog as the trio of targets dropped into the outer edge of the decoy spread. About 40 pounds of goose lay stone-dead amidst the decoys, powder snow and cattle tracks. Just like that, a new load that had been on the hand-loading bench at Federal only a week before made its field debut. For years, Federal has been working on specialized game loads based on their highly developed Flitecontrol system, new powders and special shot designs. Snow Goose is a single leg in that development path. Federal has landed on one of the hottest waterfowl load combinations possible based on new elements that make up a high-performance shotshell. The saying "Don't try this at home" applies here. Federal has designed Snow Goose as a long-range, hard-hitting steel shot load based on special propellants you don't have on the old loading bench in the basement. Don't plan to duplicate this fast mover on your Mec 500 bench press, because it just isn't going to happen any time soon. Federal powders come in railroad flat car rubber balls that require a crane to lift them. You are not shooting the same blends of magnum powders, or even fast target powders. Burn rate is everything at these kinds of pressures and velocities, and it is beyond any home-rolled creation. In its 3-inch hull length and 1 1/8 ounce of steel, Federal's Black Cloud Snow Goose moves out of a 12-bore shotgun at 1,640 feet per second or faster. Yes, faster. I recorded 1,670 fps during static ballistic testing, and that round sounded like a World War I French 75mm going off overhead. My test ammunition had been handloaded at Federal Research and development, and it was another full month before the final factory-rolled version of the new ammo got to me for field evaluation. The final load was no different from the first load, but now it was dressed in the proper shell wrapper -- a fancy Snow Goose logo box. Take a heavy plastic sabot or cylinder container, design air break flaps at the gas seal rear of the cylinder -- leaving out the front wad style pedals -- and you have a containment system that acts as a slug for the first 10 yards. After that, you have a slowly opening beehive of shot for the next 10 to 20 yards. Even downrange, everything stays very fast and very dense in terms of shot pattern. I have drilled, and I mean drilled, 100 percent patterns into a 30-inch circle at 50 yards, and still held a deadly cluster of shot to 65 yards all day long on the pattern range when testing these goose killers. On target backers made of heavy cardboard, Snow Goose will cookie-cut round wad holes through the backer at 45 yards, indicating the wad is still running at high velocity with some shot contained in the payload container. During testing, which took place for a full two months in central South Dakota, we routinely found spent wads 60 yards downrange on the snow blanket. Normal drop-off range for wads is 25 to 30 yards on a day with a brisk tailwind. Federal's Black Cloud Snow Goose is not a close-range, decoy-gunning tool. No, this hot round is designed for large, long-range targets such as spring snow geese. It is a pass shooter's dream, for sure. For hunters working over decoys on modified passing points, Snow Goose is an additional option when range extension is the rule of the day. Computer velocity recordings indicate Snow Goose BB steel will maintain a terminal velocity of 600 fps as far as 70 yards downrange. We are just starting to understand the effects of the Federal Flitecontrol sabot wad containment system. During the lapse time, the shot stays with the wad. Pellet drag is diminished substantially, allowing the individual pellets to move at a faster velocity because they don't have to fight their way downrange alone, but in a heavier-weight pack. It is like a heavy ball of shot being fired as a mass and not becoming individual pellets for some distance downrange. As a student of shot performance for more than 50 years, I'm impressed. The best part is that it works. Although some ballistic types say running any shotshell load up to 1,600 fps can only result in blown-out patterns, the Flitecontrol system turns that theory to dust. Because Flitecontrol traps the payload of shot for a short time, it only acts as a downrange jump in velocity at the point it releases the pellets. The jump is about the same exit velocity as found in current 1,450-fps steel shot load, but at a much greater distance away from the gun barrel and toward an intended target. er second for proper penetration. Snow Goose exceeds that requirement at 60 yards and is right on the working edge at 70 yards. It is a first for BB iron shot ammunition. As the ballistic table indicates, the new load extends its effective range. I believe it is going to be a factor in sales in 2010 and beyond. No need for $4-a-pop tungsten shotshells. Snow Goose loads are packaged in 25-round boxes and offered for about the same price as other high-end steel shot ammunition. Initial offerings were BB shot, but Federal has released a 1â…›-ounce No. 2 Snow Goose load, too. For those hunters who preach about staying within trap-shooting range configurations when waterfowling, fine, just don't shoot the stuff. For the others who live in the real world, steel shot ballistics just got a whole lot more effective. I make no judgment calls in the extended-range department. There have been times when a better load has saved my bacon on a decoy-shy, cold day along the big Missouri River in South Dakota. Other days, a nice little 20 bore with a load of steel No. 4s would have done the job. Over the course of those three full months of high-intensity testing on late-winter Canada geese, 97 birds were harvested. Only a single bird was lost to the red foxes and coyotes. For the most part, birds inside of 60 yards dropped like rocks, and birds inside 50 yards received massive damage. I reviewed 14 geese shot with Federal's Black Cloud Snow Goose. In every case, penetration was excellent, and damage was extensive enough to produce a quick demise. After almost three months of harvesting birds with Snow Goose, I'm completely convinced it has a positive future in the waterfowling. I don't believe we have seen the final load in this basic shotshell design.